This article is © 2018 arc@arcnineohnine.com and may not be reproduced without written consent. If you’re looking for a summary: as a motorcyclist wear high protection earplugs. To know why and which ones to use, read on but please read each article in order as they build on each other. Got protection? No, that’s a negative to a conversation on latex or sunscreen, this question is about hearing. Your hearing. What’s that you say? Eh? Yes, we’ve all been there. Met a veteran rider who smiles a lot and doesn’t take part in conversations too much? Chances are they’ve suffered hearing loss. They simply can’t hear what you’re saying. And it’s permanent. Seriously. There’s no coming back from hearing loss. You lose it and you’ll never get it back again. Sure, that’s alarmist but WTF does it have to do with me? I’m a casual motorcycle rider and I love to hear the roar of my engine, the sound of the wind in my face/lid and all the other feelings that go along with our shared love of motorcycling. Sure. Yes. But what if you can’t hear “it” anymore, what if you can’t hear your significant other (stop sniggering in the aisles), your kids (OK, perhaps a blessing) but how about the sounds of the forest while taking a break from riding, the subtle sounds that you hear just before it rains, the wind in the trees, cicadas on a summer night (perhaps too a blessing in disguise), the rhythm of your partner’s heart in an intimate moment, the gentle rustle of leaves in autumn? You won’t know because you’ve lost that and for good. There’s no coming back from hearing loss. WTF x2? Inside your ears you have tiny hairs that once damaged never regrow, these are the things that “feel” sound waves and turn them into perceptions that you interpret as sound, as speech, as the subtle nuances of being alive. So, WTF x3? You damage them, they’re damaged for good. But I’m that guy, the one we spoke of earlier who likes to hear my engine, to hear the rush of the wind as I ride. I’m not talking about cutting out all of those sounds, rather simply reducing them to a level which won’t permanently damage your hearing. So how does it work? The loudness of sound is measured in decibels (dB) – for the more scientifically inclined it’s a measure of the amount of energy or the intensity of the pressure of a sound wave, decibels are also a relative measure – and to (vastly) simplify things 1 decibel is the quietest sound that you could ever hear and the higher the decibel, the louder the sound. One final point about decibels: they’re logarithmic which means that according to our good mates at Wikipedia “an increase of three decibels is approximately a doubling of [sound] power”, keep that in mind. Peachy, so I just need to reduce the decibels? Yes and no. The human ear is most sensitive to the frequency range between 2,000 and 4,000 Hz and our hearing range is 20 Hz to 20,000 Hz. OMG, I thought this article was about protection, now it’s descending into something akin to being back at school. Bear with me gentle reader, this is an important point to get across: certain sounds are at certain frequencies. Speech is typically at 85 Hz to 255 Hz, your “typical” dog bark is around 750 Hz and those chirping birds that you hear (too) early in the morning are at around 6,000 Hz to 8,000 Hz. So what does all of this mean? When talking about hearing protection you need to keep in mind the frequency of the sound (in Hz) and the “volume” (in dB) of that sound. Why? Because when we ride our bikes we’re exposed to many different sounds such as our exhaust, our chain/sprockets, CAM chain (for the ZX-10R owners especially) and the wind buffeting our lids. These sounds are at different frequencies and at different decibels. Practically this means that we want to reduce a certain band of frequencies to a lower number of decibels so that we can still hear that approaching ambulance, fire truck etc siren and to some degree still be able to communicate with our brethren with our lids on. 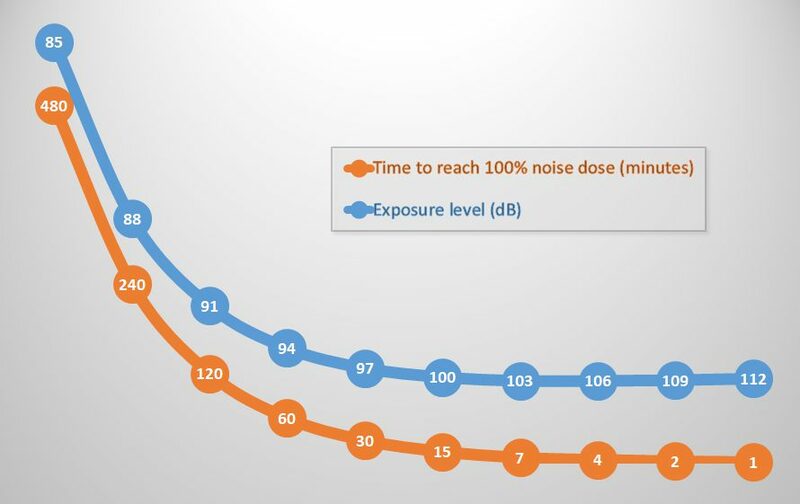 Sorry, you’ll have to decode that for me, no problem: the blue line is the sound volume in decibels from 85 through to 112 and the orange line is the corresponding amount of time you can be exposed to that sound in any one eight hour period (the “noise dose”) before permanent and irreversible hearing damage may occur. Like WTF?? That says that I can only be exposed to a 112 decibel sound for a maximum of one minute in any eight hour period. Yep. That’s right. Sobering huh? Thunderclap, chain saw. Oxygen torch (121 dB). 120 Painful. 32 times as loud as 70 dB. Steel mill, auto horn at 1 meter. Turbo-fan aircraft at takeoff power at 200 ft (118 dB). Riveting machine (110 dB); live rock music (108 – 114 dB). 110 Average human pain threshold. 16 times as loud as 70 dB. Garbage disposal, dishwasher, average factory, freight train (at 15 meters). Car wash at 20 ft (89 dB); propeller plane flyover at 1000 ft (88 dB); diesel truck 40 mph at 50 ft (84 dB); diesel train at 45 mph at 100 ft (83 dB). Food blender (88 dB); milling machine (85 dB); garbage disposal (80 dB). 80 2 times as loud as 70 dB. Possible damage in 8 h exposure. Passenger car at 65 mph at 25 ft (77 dB); freeway at 50 ft from pavement edge 10 a.m. (76 dB). Living room music (76 dB); radio or TV-audio, vacuum cleaner (70 dB). 70 Arbitrary base of comparison. Upper 70s are annoyingly loud to some people. Quiet suburb, conversation at home. Large electrical transformers at 100 ft 50 One-fourth as loud as 70 dB. Library, bird calls (44 dB); lowest limit of urban ambient sound 40 One-eighth as loud as 70 dB. As we’ve seen from the table above there’s a huge variety in reported motorcycle noise, so how much sound does my bike make? Sure there’s a limit in Australia on how loud your bike can be for road registration and typically one of the first “performance enhancements” that people make to their bike is to fit an aftermarket exhaust can or even a full system together with silencer baffles that go in the end of your pipe (which are often removed). But that’s just one part of the sound that our bikes create. Remember wind noise? The sound of the wind rushing around your lid, your faired or naked bike whilst aerodynamic creates a significant amount of wind noise. If you have a quiet, low powered bike with a stock pipe, you’ll be OK? No, not likely. All the research shows that at above 60-70 km/h wind noise is the most significant factor, not the sound of your engine and typically it’s the air flow from the screen as it hits your chest, neck or head that’s the main culprit. Sure helmet design plays a part here but your bike’s screen seems to have more of an effect. Just how noisy is it riding at 100 km/h? That’s a tough one because as we’ve already seen there are a vast variety of bikes with different fairing, screen and engine configurations, your height affects wind blast and many, many different exhaust systems and helmet designs; a stationary bike can even idle at 85 dB! From the studies I’ve read and from the above tables it can be from 90 dB at 60 km/h to 110 dB or more at 100km/h and the resultant exposure time can be from mere seconds to two minutes before permanent irreversible hearing damage may occur. For this author, whose typical rides are between six to eight hours, this means that I need to reduce the sound to 85 dB or less if I want to keep my hearing (mostly) intact. What about just commuting every day? I’d love to be doing 100 km/h but it’s closer to a crawl most days. Yep, that’s an issue but the noise levels that you’re exposed to can still be significant, the average traffic noise is often 65 dB or more (and that’s excluding truck engine braking). OK, armed with all of that where does that leave me, a humble motorcycle rider? In the same way that we wear helmets, wear hearing protection. The why should be obvious by now: our bikes can create a lot of noise and riding at freeway speeds creates a lot of wind noise, these two can permanently and irreversibly damage your hearing. Fact. Disequilibrium is a loss of your sense of balance, something that as motorcyclists we somewhat cherish. Fatigue? Yep, you will tire more quickly without ear protection too. Right, I’m now really convinced, but where to start? There are several different types of hearing protection available to you as a motorcyclist from cheap single use foam and reusables through to advanced hand-made custom moulded silicon.